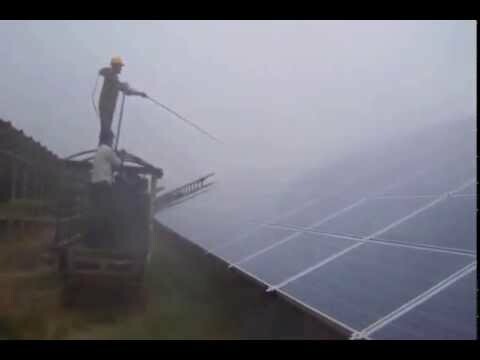 Solar Panel Cleaning System In India for enhancing solar modules efficiency to generate maximum Solar Power?! We, at Bharat Solar Energy, manufacture Solar PV Modules/Solar Plate Cleaning System - The Automatic Solar Panel Cleaning Machine with Water Jet in Joint-venture. We Manufacture Solar PV Modules Cleaning Equipment/Automatic PV Modules Cleaning Machine for both MW Solar Power Plant or Small Rooftop Solar Power Plants. Our Solar Panel Cleaning Machine with Water Jet is meant to be used for maintenance purpose for keeping your Solar Power Plant efficient to generate maximum Solar Energy, and thereby enhancing Solar Energy Capacity. 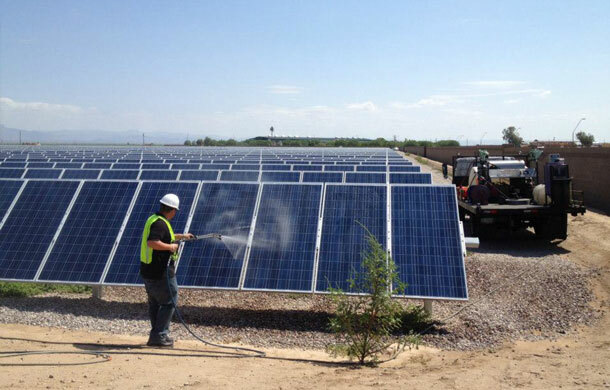 The Solar Power Plant/PV Modules Cleaning System is of effective, efficient, faster & economical. Our Solar Panel/Solar Plate Equipment which enhances the Capacity of Solar Panel Plant for maximum Solar Energy generation. To purchase our Solar PV Modules Cleaning Machine do contact us today. · Immediate cleaning results can be achieved. · Work within arm’s reach. · Soft water required, water consumption 1 liter per panel. · No external power source required. · Increase efficiency/output up to 40% from each panel. · Savings up to 80% on water resources.